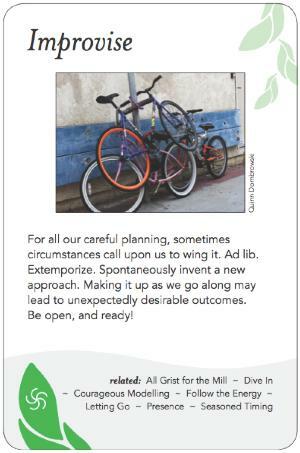 For all our careful planning, sometimes circumstances call upon us to wing it. Ad lib. Extemporize. Spontaneously invent a new approach. Making it up as we go along may lead to unexpectedly desirable outcomes. Be open, and ready! In a sense, all facilitation and all group process are improvisation -- when people get together, anything might happen. "Whatever happens is the only thing that could have happened". Improvising can be anything from responding in the moment to deal with technical glitches (the room is too cold, the markers don't write, the fire alarm goes off), to dealing with interpersonal conflicts that bubble up in a small group, to how the group spontaneously and in a self-organized manner decides to approach a situation. Improvising is done within a container, within a context of boundaries and rules. It plays to our emotional side, particularly in using our voices and bodies. people need to know the rules (Yes, and -- the embodiment of Appreciative Inquiry). It can engage and free up the energy of the group, enable them to change topics, to open the field of thought, to widen back out, to collect new ideas, to have fun, to build teamwork and collaboration, to reinforce appreciation and overcome negativity. Debrief of improvisation (when applied other than for an energy booster) can distill learning, engender creative ideas, enable skillbuilding, increase awareness of acceptance, agreement, trust, etc. There has to be trust among the participants, and the participants have to learn to exercise some self-control. Improvisation can be scary for novices and introverts, who may need to be encouraged, or eased into the process. The "Yes, and..." practices that apply improv to organizational problem-solving and creativity. Spontaneous expression, within an explicit container, that welcomes chaos as part of creativity. In music, a jam session is a collaboration that arises from familiarity with a particular genre while experimenting with style and details. It is a finely honed balance between order and chaos. For example, while the notes chosen (and their sequence and timing) will be free-form, if someone hits a note that is outside the key currently being played, they will typically soon resolve back into that key, so as to maintain a unifying theme. The character of any particular jam is influenced by genre, instruments, relationships among the players, and many other things. In group work, we are using the term jam session to refer to a conversation that is less linear, less careful, more simultaneous than a typical meeting. The purpose is to invite creative inspiration. When the group feels stuck and needs new ideas, business as usual is not working, or the energy has become dull, those are occasions to consider invoking this pattern. With a driving principle of mutual inspiration, the dynamics involved are extremely rich in content and context. Cues such as body language and eye-contact become even more influential than in a regular session. Some would say that "jamming" creates a pathway for spiritual expression. The chemistry among participants can strongly affect how much synergy emerges. The technique most associated with this is brainstorming. There are other, less well-known methods of brainstorming such as the "card-storming" or "snow card" approach developed by the Institute for Cultural Affairs, where the ideas are written on separate pieces of paper instead of spoken aloud, then clustered by topic and organized. The facilitation method most akin to a jam session is Dynamic Facilitation (and the most opposite is probably Roberts Rules of parliamentary procedure). However, you can invoke this pattern without doing any of these methods, simply by inviting people to share openly, jump into the conversation without waiting for a turn, and not worry about keeping on topic. Paradoxically, taking the pressure off to arrive at a useful product often increases the chances of actually getting one. One thing to watch out for when doing this is that less assertive members may have trouble getting a word in. Thus this approach may need to be balanced with calmer, more ordered approaches in order to garner the wisdom of the full group. Another thing to keep in mind when guiding this process is that like a tender seedling trying to sprout, creative new ideas often need protection in order to grow. Thus the guideline of "no evaluations" during brainstorming. Sometimes even a question can feel too judgmental and throw someone off. So consider carefully what ground rules or other techniques will create this container in your particular circumstance. Because of the immediacy of the experience, it's much easier to get a sense for how a jam session goes by joining in one than by reading about it or watching one. Musically, one interesting example of a band that jams a lot and isn't afraid to publish the results (good and awful) is the Grateful Dead. The Internet has created new prospects for musical collaboration. While playing music together, Feedback loops must be instantaneous. A cue, for example, can be metaphysically "sensed" by all the participants at once, allowing everyone to cut to a "bridge" at the same time or change keys. Feedback between what you are hearing and playing is a continuous process within the Jam. In group conversations, as well, Feedback loops provide the information needed to respond to. Following the Energy keeps the Jam Session dynamic and alive. Instead of keeping to a predetermined topic or agenda, during the Jam time people can follow ideas to their conclusion, or jump around among them, as they feel drawn in the moment. As mentioned above, the Jam Session rests on a delicate balance between Structure vs. Flexibility.